The self-guided walking tour is downloadable from the “Douglas 63rd Walking Tour Brochure” link below. 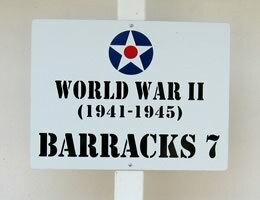 The tour begins at the WWII Flight Training Museum, which was originally Barracks 7. It then moves to the south (left) toward the Department of Natural Resources office, which was originally the Administration Building. There are signs like the one at the right on each building describing its original use. Go first to the WWII Flight Training Museum (Barracks 7) and then walk south around Airport Circle and then back north to the hangars. After Hangar 2, cut through the center of the campus’ central square back to the Administration Building. The walking tour is only about 1/2 mile and is estimated to take 20 minutes to 1 hour, depending on how long the walker spends in the hangar. The link below is to a 8-1/2 by 11″ PDF containing the walking tour brochure. It is intended to be printed double-sided and then tri-folded into thirds. Feel free to download and either print or view the brochure. If you do not wish to download the brochure, simply return to the Museum page.